Looking for a bargain or a great selection of shopping venues? These outlet shopping malls in Maryland and Virginia are worth the drive. Within an hours drive from Washington, DC, you will find the best selection of stores and the best prices on designer and brand name items from clothing to electronics to housewares. Arundel Mills - 7000 Arundel Mills Circle, Hanover, MD. (410) 540-5110. One of the Baltimore-Washington, DC area's largest shopping, dining and entertainment destinations. Arundel Mills features over 200 specialty retailers, a variety of restaurants, a 24-screen movie theater, and a teen entertainment complex. Clarksburg Premium Outlets at Cabin Branch - 22705 Clarksburg Road, Clarksburg, MD. (240) 702-1200. The region's newest outlet center brings upscale shopping and dining, plus an outdoor amphitheater to northern Montgomery County. The village-style center features 90 high-quality upscale retailers including Ann Taylor, Banana Republic, Disney, Fossil, Gap, Fragrance Outlet, Motherhood, Nike Factory Store, Polo Ralph Lauren, Sketchers, Under Armour and more. Tanger Outlets National Harbor - 6800 Oxon Hill Road, National Harbor, MD. (301) 567-3880. The new outlet shopping center opened in November 2013 in Prince George’s County, MD just 8 miles from Downtown Washington DC, Tanger is the closest outlet center to the nation's capital. Leading brand name stores include Calvin Klein, H&M, IZOD, Gap Factory Store, American Eagle Outfitters, Tommy Hilfiger, Banana Republic Factory Store, White House Black Market Outlet, Chico's Outlet, Columbia, Brooks Brothers Factory Store, Aeropostale, P.S. by Aeropostale, J. Crew Factory Store, Le Creuset Outlet and many more. Leesburg Corner Premium Outlets - 241 Fort Evans Road, Suite 241, Leesburg, VA. (703) 737-3071. Upscale outlet shopping in an outdoor village setting. Over 110 stores featuring designer and sportswear apparel, home and furnishings, jewelry, gifts and much more. Retailers include stores like Ann Taylor, Banana Republic, Calvin Klein, Eddie Bauer, Jones New York, Reebok, OshKosh B'Gosh, Crate & Barrel, Pottery Barn and more. Potomac Mills Outlet Mall - 2700 Potomac Mills Circle, Prince William, VA.
One of the world's largest outlet malls with more than 220 discount stores featuring designers and brand names including Nordstrom RACK, OFF 5th Saks Fifth Avenue,Polo Ralph Lauren,, Brooks Brothers, Nautica, Banana Republic, Mikasa, GAP, fye, J Crew, the North Place and more. Potomac Mills has numerous dining options and an 18-screen movie theater. Outlet center with over 100 retailers, a food court and a children’s playground. The name brand outlet stores include Adidas, Banana Republic, Brooks Brothers, Calvin Klein, Coach, Gap Outlet, Guess, J. Crew, Kate Spade, Nike, Tommy Hilfiger, Under Armour and many more. 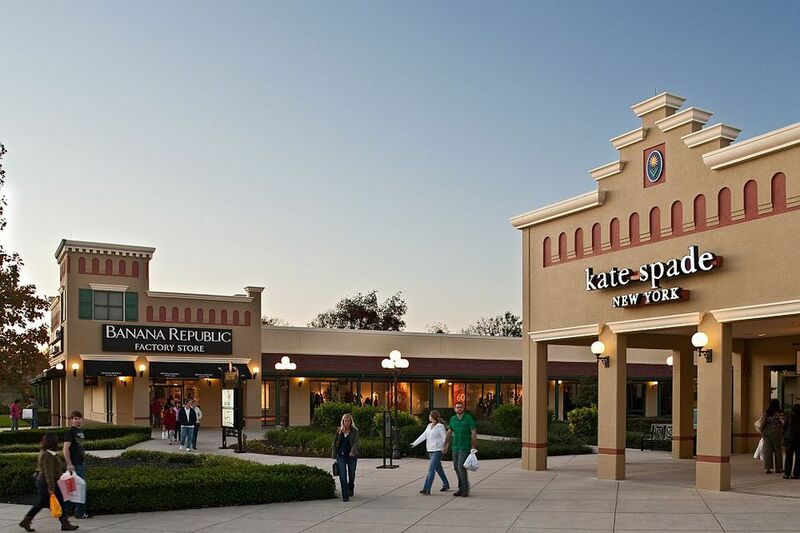 Over 60 designer outlet stores located just 10 miles east of the Chesapeake Bay Bridge. Retailers include COACH Factory, Polo Ralph Lauren Factory Store, Banana Republic Factory Store, Old Navy Outlet, and many more.